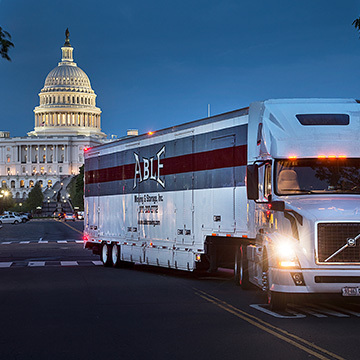 Able Moving and Storage has the skills, experience, and resources to manage all your corporate relocation needs in McLean VA. We excel as a corporate relocation company by providing the most efficient and dependable McLean VA corporate relocation services available throughout the US and worldwide. We have worked with a wide range of clients throughout McLean VA and the surrounding area, coordinating relocation services that cater to their particular company policies, budgets and timelines, while at the same time providing a smooth, problem and stress-free relocation for your company assets and employees. When you choose Able Moving & Storage as your professional corporate relocation company, you will receive a dedicated project manager for the corporate relocation project. As a large, independent moving and storage company, Able Moving & Storage, Inc. performs “pack, load & haul” relocation services, with dedicated crews for specific accounts, from point-to-point throughout McLean VA and beyond. This is done by dedicating 35% of our crews, and fleet to these corporate agreements. This consists of 20 teams of full-time employees, operating out of eleven 28’ straight trucks, and nine tractor trailers. These teams are experienced with supporting expedited services from origin to destination throughout the east coast for our corporate clients. Our people, skills, experience, and equipment ensure successful and timely relocations that will meet or exceed your standards and goals. Able Moving & Storage’s fleet is company-owned, well-equipped, air-ride moving vans, straight trucks, tractor trailers and other vehicles. Able Moving & Storage fleet vehicles are professionally maintained and receive a daily inspection for cleanliness and a monthly inspection to ensure that they meet DOT and state standards. By choosing Able Moving and Storage as your professional corporate relocation company, you can — without a doubt — expect a very secure, highly customized, and complete relocation service for your family and/or employees. We are committed to providing perfectly organized corporate relocation services from beginning to end, with a focus placed on personal customer care. As a moving and storage company that has been in operation for over a quarter of a century, we are able to call on immense expertise and resources in the coordination of both long distance and local moves of all sizes. You can rest easy, knowing that Able Moving & Storage will make your employee’s relocation process in McLean VA comfortable, efficient and easy. Beyond the basics of logistics and move management, Able Moving & Storage provides a range of helpful information throughout the corporate relocation process. This includes moving checklists, packing tips and much more. We track everything throughout our move management system to ensure no detail is overlooked. A dedicated project manager will provide updates and guidance on every step in the corporate relocation process. You corporate relocation specialist will suggest ideas for any potential improvements, and will ensure that we are assisting you in the most effective way so that you will successfully meet the goals of your company’s relocation plan. Our highly experienced project managers, customer service representatives, professional truck operators, and very experienced crews will guide your transference successfully through the moving process from start to finish.